For Use With: Stanley Fastening PHT150C, TR100, TR200, TRE500, TR100HL; Arrow: T50, T50PBN, ETF50, T55, HT50; Powershot: 5700 For Use With: Stanley Fastening PHT150C, TR100, TR200, TRE500, TR100HL; Arrow: T50, T50PBN, ETF50, T55, HT50; Powershot: 5700 Precision made. For use with model P22 plier-type stapler. Precision made. For use with model P22 plier-type stapler. Use steel rivets for very heavy duty jobs and when riveting steel to steel. Use aluminum rivets for lighter weight jobs and materials such as aluminum, fabrics, plastics, leather, etc. Use washers when joining soft materials or when existing hole is oversize. For use with Arrow model HT19 tacker. Medium strength aluminum can be used with aluminum and where rust is a potential problem. Reusable, full visibility packaging simplifies product selection and storage. Use with Ramset, Hilti, Remington and most powder actuated tools that use 22cal. single shots, 27cal. 10 strips and 25cal. discs. For models of low velocity powder actuated tools with.300 or larger barrel diameter. Knurled shank pins for fastening to structural steel; 0.145" diameter. Medium strength aluminum can be used with aluminum and where rust is a potential problem. Reusable, full visibility packaging simplifies product selection and storage. Use steel rivets for very heavy duty jobs and when riveting steel to steel. Use aluminum rivets for lighter weight jobs and materials such as aluminum, fabrics, plastics, leather, etc. Use washers when joining soft materials or when existing hole is oversize. For Ramset 721, MasterShot, TriggerShot (sku # 291.9660) and HammerShot tools; Ramset loads provide the powder to penetrate hollow block and concrete; consistent, quality performance in every load; highest quality powder loads. Use steel rivets for very heavy duty jobs and when riveting steel to steel. Use aluminum rivets for lighter weight jobs and materials such as aluminum, fabrics, plastics, leather, etc. Use washers when joining soft materials or when existing hole is oversize. Used to connect gutter parts together and fasten other light-gauge metals. Theses rivets feature durable aluminum construction. 7/16 " crown. For Use With Bostitch: PC1000, PC2000, PC4000, PC5000, H30-8 and P6C-8 tackers. STCR50191/2-4M and STCR50191/2-1M do not fit H30-8 or P6C-8 tackers. STCR50191/2-1M also fits PC3000. With 7/8" washer to prevent overdrive and to increase holding value when fastening wood or thin metal to concrete or structural steel. Fits all Ramset, Hilti, Remington and most powder actuated tools that use 22cal. single shots, 27cal. 10 shot strips and 25cal. discs. 0.145" shank diameter. With 7/8" washer to prevent overdrive and to increase holding value when fastening wood or thin metal to concrete or structural steel. Fits all Ramset, Hilti, Remington and most powder actuated tools that use 22cal. single shots, 27cal. 10 shot strips and 25cal. discs. 0.145" shank diameter. Medium strength aluminum can be used with aluminum and where rust is a potential problem. Reusable, full visibility packaging simplifies product selection and storage. Medium strength aluminum can be used with aluminum and where rust is a potential problem. Reusable, full visibility packaging simplifies product selection and storage. Used to connect gutter parts together and fasten other light-gauge metals. Theses rivets feature durable aluminum construction. Arrow Multi-Pack Staple, Heavy Duty, Series: T50, 1/2 - 3/8 in Leg Length, Includes: (625) 1/4 in, (625) 3/8 in and (625) 1/2 in Leg Length Staples, 1875 Pieces Fits Bostitch T5-6, H30-6 and P6C-6. Medium strength aluminum can be used with aluminum and where rust is a potential problem. Reusable, full visibility packaging simplifies product selection and storage. For use in model HT-65 staple hammer tacker extra heavy-duty. Made of 18 gauge steel, head hides brad in wood. Medium strength aluminum can be used with aluminum and where rust is a potential problem. Reusable, full visibility packaging simplifies product selection and storage. 7/16 " crown. For Use With Bostitch: PC1000, PC2000, PC4000, PC5000, H30-8 and P6C-8 tackers. STCR50191/2-4M and STCR50191/2-1M do not fit H30-8 or P6C-8 tackers. STCR50191/2-1M also fits PC3000. Use steel rivets for very heavy duty jobs and when riveting steel to steel. Use aluminum rivets for lighter weight jobs and materials such as aluminum, fabrics, plastics, leather, etc. Use washers when joining soft materials or when existing hole is oversize. Use steel rivets for very heavy duty jobs and when riveting steel to steel. Use aluminum rivets for lighter weight jobs and materials such as aluminum, fabrics, plastics, leather, etc. Use washers when joining soft materials or when existing hole is oversize. Medium strength aluminum can be used with aluminum and where rust is a potential problem. Reusable, full visibility packaging simplifies product selection and storage. Made of 18 gauge steel, head hides brad in wood. Perfect for everyday stapling needs around the home or office. Lightweight with convenient handle lock. Quick clear mechanism. Chrome plated steel construction. Uses 1/4" and 5/16" light duty staples. Great for screen repairing, light upholstery work, arts and crafts projects and scores of other light duty household tacking chores. Comfortable soft grip and handle, easy squeeze mechanism, built-in stapler remover, large reload window on bottom of stapler. Reusable, 6 storage compartments 25 each 1/8" x 1/8" aluminum and steel; 20 each 1/8" x 1/4" aluminum and steel; 15 each 1/8" x 1/2" aluminum and steel. For Use With: Stanley Fastening PHT150C, TR100, TR200, TRE500, TR100HL; Arrow: T50, T50PBN, ETF50, T55, HT50; Powershot: 5700 For T32, T32MHT30 Staples & HT30 Hammer Guns. Use with Ramset, Hilti, Remington and most powder actuated tools that use 22cal. single shots, 27cal. 10 strips and 25cal. discs. For models of low velocity powder actuated tools with.300 or larger barrel diameter. Knurled shank pins for fastening to structural steel; 0.145" diameter. For T32, T32MHT30 Staples & HT30 Hammer Guns. Load full strip of (100) ARROW staples of .030 wire in sizes 1/4", 5/16" and 3/8" staples. Visual refill window. Perfect for screen repairing, light upholstery work, kitchen shelf trimming, closet lining, cornice covering and scores of other light duty household tacking chores. No. JT21M : All steel construction. Jam-proof mechanism. Hand-contoured handle. Built-in staple lifter. Household baked enamel finish. No. JT21CM: Durable hi-impact molded plastic housing. Safety handle lock. All steel channel and track for non-wearing, jam-proof performance. For use in model 107 stapler. Painted blue. All steel construction with a chrome finish, contoured handle, plastic stop, jam proof mechanism and visual refill window. Used in applications such as displays, silk screens, light upholstery, crafts and posters. All-steel construction with comfortable vinyl grip. Spring-loaded handle for easy rivet loading and ejection. Changeable nose piece takes 1/8" and 5/32" diameter rivet in one hole and 3/16" in other hole. To change hole size, loosen screw on nose piece plate and pivot plate around, tighten screw. NOTE: Not recommended for use with 3/16" All Steel Rivets. Use with Ramset, Hilti, Remington and most powder actuated tools that use 22cal. single shots, 27cal. 10 strips and 25cal. discs. For models of low velocity powder actuated tools with.300 or larger barrel diameter. Knurled shank pins for fastening to structural steel; 0.145" diameter. For use with Arrow model No. HT-50A, T50, and T55 series staple guns. Use in areas that need the protection of stainless steel to help fight corrosion. These are not made of 'Monel' which is for use in areas exposed to salt water. The T50 staples are made of .050 wire. They come 1,250 to a pack. For use in model P35 stapler (684.7818). Able to penetrate thicker paper stock or staple more pages together. 5,040 staples per box. For use with Arrow model No. HT-50A, T50, and T55 series staple guns. Use in areas that need the protection of stainless steel to help fight corrosion. These are not made of 'Monel' which is for use in areas exposed to salt water. Easy to squeeze design - female can squeeze with one hand; comfortable ergonomic grip, precise; user friendly forward action design; compact for easy storage; ideal for projects around the home: home decor, decorating, quick repairs around the house, crafting and hobby projects; uses "JT21" staples in three sizes up to 3/8" (10mm). Use with Ramset, Hilti, Remington and most powder actuated tools that use 22cal. single shots, 27cal. 10 strips and 25cal. discs. For models of low velocity powder actuated tools with.300 or larger barrel diameter. Knurled shank pins for fastening to structural steel; 0.145" diameter. For upholstery, insulation, weather stripping and more. Fits T2025 staple gun tacker. Not for Marine Applications. Stainless steel to resist rust. Use With: Arrow staple or staple/nail gun Nos.ET50, ETC50, ETF50BN, ETF50PBN, ETFX50 (307.9233), ETN50), T50 (647.9125), T50OC, T55 (647.8093), in hammer staple/tacker No.HT50 (688.1007), in brad nailer/staple gun No.T50PBN (696.5909), and in tacker gun No.T55C. All steel construction; chrome finish. Hand guide loop. Camp-actuated double leverage. Deep 2-1/2" throat. Easy-to-get-at mechanism. Loads (150) No. P22 staples only, in two sizes, 1/4" (sku # 600.1283) and 5/16" (sku # 424.3184). All steel construction with comfortable Hi-Viz non slip vinyl grip and spring loaded handle for easy loading. Stainless steel rivets are not for use with manually operated rivet tools. Includes: (25) medium 1/8", (25) medium 3/16" aluminum rivets, interchangeable nose piece, and custom molded case Use with Ramset, Hilti, Remington and most powder actuated tools that use 22cal. single shots, 27cal. 10 strips and 25cal. discs. For models of low velocity powder actuated tools with.300 or larger barrel diameter. Knurled shank pins for fastening to structural steel; 0.145" diameter. For use in Swingline Desa 800, 800X, 900, 1000, 10060, 31600, 31800, 34201, 34301, 34302, 80000, 80020; Master Mechanic 174839, 345025, 136150, TRE-50MM, TRE-300MM; Sear's Craftsman 68477, 68478, 6843, 6846, 68642, 68423, 68471, 68481; Black & Decker 9701, 9700; Stanley Parker TR70, TR75, TR80, TRE-50, TRE100, TRE300; Ace Hardware 27175, 22084 and 22087. The T50 staples are made of .050 wire. They come 1,250 to a pack. Flat crown used for ceiling tile insulation. Pack size: 1,250. Use with Ramset, Hilti, Remington and most powder actuated tools that use 22cal. single shots, 27cal. 10 strips and 25cal. discs. For models of low velocity powder actuated tools with.300 or larger barrel diameter. Knurled shank pins for fastening to structural steel; 0.145" diameter. Coated to improve corrosion resistance in treated lumber and other applications. Fits most powder actuated tools that use 22cal. single shots, 27cal. ; 0.145" shank diameter. The T50 staples are made of .050 wire. They come 1,250 to a pack. For use in No. T-25 low voltage wire staple gun tacker. For use in No. T-25 low voltage wire staple gun tacker. For use in Swingline Desa 800, 800X, 900, 1000, 10060, 31600, 31800, 34201, 34301, 34302, 80000, 80020; Master Mechanic 174839, 345025, 136150, TRE-50MM, TRE-300MM; Sear's Craftsman 68477, 68478, 6843, 6846, 68642, 68423, 68471, 68481; Black & Decker 9701, 9700; Stanley Parker TR70, TR75, TR80, TRE-50, TRE100, TRE300; Ace Hardware 27175, 22084 and 22087. With 7/8" washer to prevent overdrive and to increase holding value when fastening wood or thin metal to concrete or structural steel. Fits all Ramset, Hilti, Remington and most powder actuated tools that use 22cal. single shots, 27cal. 10 shot strips and 25cal. discs. 0.145" shank diameter. 7/16 " crown. For Use With Bostitch: PC1000, PC2000, PC4000, PC5000, H30-8 and P6C-8 tackers. STCR50191/2-4M and STCR50191/2-1M do not fit H30-8 or P6C-8 tackers. STCR50191/2-1M also fits PC3000. For upholstery, insulation, weather stripping and more. Fits T2025 staple gun tacker. Chrome plated steel construction for durability; soft rubber grip handle; bottom loading magazine saves time and hassle; visual refill window shows the user if they have staples loaded; uses T50 stples: 1/4" (6mm - sku #s - 611.7238, 187.2142); 5/16" (8mm - sku #s - 584.6472, 509.4974); 3/8" (10mm - sku # 962.6045); 1/2" (12mm - sku #s 192.8522, 060.7077); 17/32" (13mm) and 9/16" (14mm); designed in USA. Use any brand or size of heavy duty staples. A unique black painted All in 1 staple gun. Easy drop in staple loading. Viewing window lets you know if you need to load staples. Use with: Surebonder #4, #5, #6, #11 heavy duty staples or Arrow T50, Powerfast, Stanley, Duo-Fast, Bostitch, Craftsman, Master Mechanic, Do-it, Ace Hardware, Black & Decker and Unifix staples. Right angle riveter sets 1/8", 5/32" and 3/16" diameter rivets. Spring loaded handle ejects rivet stem automatically, slim nose design fits in tight hard to reach places. With 7/8" washer to prevent overdrive and to increase holding value when fastening wood or thin metal to concrete or structural steel. Fits all Ramset, Hilti, Remington and most powder actuated tools that use 22cal. single shots, 27cal. 10 shot strips and 25cal. discs. 0.145" shank diameter. Use for everyday stapling needs around the home or office. Lightweight with convenient handle lock for safe storage, quick jam clear mechanism saves time and hassle, chrome plated steel construction for durability. Lightweight design; Pro's choice to install insulation; ergonomic soft rubber grip provides maximum comfort; durable all-steel construction, chrome magazine and hardened steel internal components; uses 3 sizes of staples 1/4", 5/16" and 3/8". With 7/8" washer to prevent overdrive and to increase holding value when fastening wood or thin metal to concrete or structural steel. Fits all Ramset, Hilti, Remington and most powder actuated tools that use 22cal. single shots, 27cal. 10 shot strips and 25cal. discs. 0.145" shank diameter. The compact design and precision make it easy to use one-handed, leaving your other hand free to assist in your project, such as holding your fabric taut; powerful; uses T50 staples: 1/4" (skus 611.7238, 187.2142), 5/16" (skus 584.6472, 509.4974), 3/8" (sku 962.6045) and 1/2" (skus 192.8522, 060-7077). 7/16 " crown. For Use With Bostitch: PC1000, PC2000, PC4000, PC5000, H30-8 and P6C-8 tackers. STCR50191/2-4M and STCR50191/2-1M do not fit H30-8 or P6C-8 tackers. STCR50191/2-1M also fits PC3000. All steel construction; high carbon hardened steel working parts. Visual refill window. Patented jam-proof mechanism. Easy double leverage operation. Loads (85) Arrow No. T-50 staples only of .050 wire in 6 sizes; 1/4", 5/16", 3/8", 1/2", 9/16" and Ceiltile from light to heavy duty work. Used by building contractors, home do-it-yourselfers, and speciality trade applicators. For use in Swingline Desa 800, 800X, 900, 1000, 10060, 31600, 31800, 34201, 34301, 34302, 80000, 80020; Master Mechanic 174839, 345025, 136150, TRE-50MM, TRE-300MM; Sear's Craftsman 68477, 68478, 6843, 6846, 68642, 68423, 68471, 68481; Black & Decker 9701, 9700; Stanley Parker TR70, TR75, TR80, TRE-50, TRE100, TRE300; Ace Hardware 27175, 22084 and 22087. Use steel rivets for very heavy duty jobs and when riveting steel to steel. Use aluminum rivets for lighter weight jobs and materials such as aluminum, fabrics, plastics, leather, etc. Use washers when joining soft materials or when existing hole is oversize. With 7/8" washer to prevent overdrive and to increase holding value when fastening wood or thin metal to concrete or structural steel. Fits all Ramset, Hilti, Remington and most powder actuated tools that use 22cal. single shots, 27cal. 10 shot strips and 25cal. discs. 0.145" shank diameter. Exclusive anti-jam mechanism. Low stroke handle to reduce hand fatigue. High power and penetration. Easy slide full stick staple load. Provides easier penetration into concrete, drywall, and structural steel. 7/8" washer prevents overdrive and increase holding value when fastening wood or thin metal to concrete or structural steel. Fits most powder actuated tools that use 22cal. single shots, 27cal; 0.145' shank diameter. Precision made. Use in No. JT21M, JT21CM, and J27 staple gun tackers. Precision made. Use in No. JT21M, JT21CM, and J27 staple gun tackers. For use in Swingline Desa 800, 800X, 900, 1000, 10060, 31600, 31800, 34201, 34301, 34302, 80000, 80020; Master Mechanic 174839, 345025, 136150, TRE-50MM, TRE-300MM; Sear's Craftsman 68477, 68478, 6843, 6846, 68642, 68423, 68471, 68481; Black & Decker 9701, 9700; Stanley Parker TR70, TR75, TR80, TRE-50, TRE100, TRE300; Ace Hardware 27175, 22084 and 22087. Gives ultimate power with minimal effort; simply squeeze the staple gun handle, position on the work piece and pull the trigger to set the staple; ideal for hard-to-reach areas and accuracy; easy drop in staple loading; adjustable depth drive, fabric/screen gripper; viewing window lets you know if you need to load staples; use Surebonder #4 or Arrow T50 heavy duty staples. Perfect for pros in need of a lightweight hammer tacker that has the power to complete projects quickly; has a quick loading magazine design built to help pros load the tool quickly; has a durable chrome plated steel housing, well balanced handle which makes it ideal for insulation and housewrap; visual refill window shows the user if they have staples loaded. Lightweight die cast aluminum design with steel handle, over molded rubber grip for comfort and convenient bottom loading for quick and easy reloading. Nickel chrome plated steel magazine. Used for house wrap, tar paper. Weight 1.9 lb., magazine capacity 84 staples, 1/4" ? 9/16" STCR5019 series Power Crown staples; Orgill sku#s, 160.8504, 341.8647, 433.9438, & 744.7915. Full- rubber grip absorbs shock and protects hand. Loads two full sticks of Stanley Sharp Shooter TRA700 or Arrow T-50 heavy duty staples (1/4"-3/8") capacity is 84 staples. 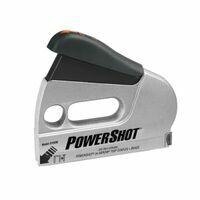 Arrow Staple and Brad Nail Gun, Heavy Duty, Series: PowerShot, Die Cast Aluminum, For Trim/Molding, Roofing, Housewrap, Flooring and Picture Framing Designed for reaching into hard to get to places. For stapling from any position or angle. Heavy duty steel construction with a powerful drive for accommodating tougher materials. Ideal for sealing and bagging applications. Chrome finish. Hand guide loop. Cam actuated double leverage mechanism. 2-1/2" throat for better reach. Great for wiring projects; compact; powerful; precise; grooved guide ensures consistent stapling; for wires up to 1/4" (6mm) diameter; uses T25 staples (sku #s: 415.8796, 415.8812, 415.8846). For heavy duty stapling hammer model No.H2B. Precision made. Use in No. JT21M, JT21CM, and J27 staple gun tackers. All steel construction. Comfortable vinyl grip. Spring-loaded handle for easy rivet loading and ejecting. Extended nose for hard-to-get-at places, Locks when not in use. Used on aluminum, canvas, metal; also for installing, repairing and 1,001 uses. Includes 4 nose pieces with wrench. Use 4 rivet sizes: 3/32" (2.5mm), 3/16" (5mm). Provides easier penetration into concrete, drywall, and structural steel. 7/8" washer prevents overdrive and increase holding value when fastening wood or thin metal to concrete or structural steel. Fits most powder actuated tools that use 22cal. single shots, 27cal; 0.145' shank diameter. Sets rivets at a right angle or straight on with a simple twist of riveter head, rugged die cast metal construction for extra life. Improved leverage sets 1/8", 3/32", 5/32", and 3/16" diameter with ease. Alternate nose pieces and wrench store in handle. Rugged die cast metal construction. Sets 1/8", 5/32" and 3/16" diameter rivets. Especially suited for stainless steel rivets in marine applications. Equipped with removable ejector spring. For use in No. T-25 low voltage wire staple gun tacker. Easy-squeeze technology helps reduce actuation force; anti-jam magazine prevents jams and misfires; heavy-duty stapling mechanism for durability; surface guard to prevent damage to underlayment material; ergonomic design is weighted forward for comfortable use; uses Dewalt Heavy Duty Staples series DWHTTH700 available sizes 5/16" (8mm), 3/8" (10mm), 1/2" (12mm), also uses same range of Stanley TRA700 series Heavy Duty Staples plus Arrow T-50 Heavy Duty Staples. Unique ``Twistable" Head, rotates 360 degrees for any angle riveting. All-steel construction. Comfortable vinyl grip. Spring-loaded handle for easy rivet loading and ejecting. Extended nose for hard-to-get-at places. Lock clip when not in use. Four nose pieces with wrench. Uses four rivet sizes: 3/32" (2.5mm), 1/8" (3mm), 5/32" (4mm), and 3/16" (5mm). Not for use with stainless steel rivets.